Question. Can you even count a salad as a recipe? Don’t answer that. Today, it counts. And so, in the spirit of it’s-so-hot-there-is-no-way-I-want-to-turn-on-my-oven meals, I decided to share with you guys a super simple salad. True, this is probably more of a side salad, unless you wanted to eat an entire bag of arugula and maybe a pound of pancetta, but who really wants to sit down to a huge meal when it’s over one hundred degrees outside anyway? 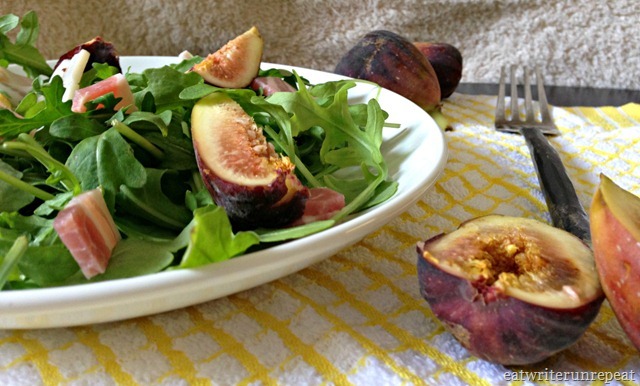 So I’ve been craving fresh figs since I read this post by Jess of How Sweet It Is. Oh, and for the record? 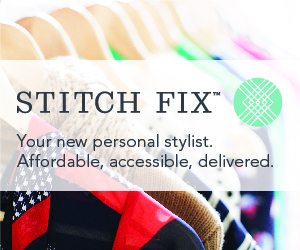 If you haven’t checked out her blog already, do it now. She’s hilarious. And she’s a fellow Pennsylvanian which makes her extra cool. Have I mentioned that I am from Pennsylvania? Right. I was talking about figs. I actually bought figs from a farmers market back in winter, except that they were dried and me being the budding genius that I am couldn’t figure out why they didn’t look like the figs I wanted to cook with, which were fresh figs. Yeah. Not my best moment. So anyway, I was at Trader Joe’s impulse buying grocery shopping, and I found a package of fresh figs! For $5.99! (Sorry, Jess!) Anyway, I snatched them up and promptly went home and made this salad. Yum. Sidebar: My sister and I went to her grocery store in between writing this post and posting this post, and I found fresh figs for $1.99. Each. Holy expensive! Had they been that expensive in Virginia, ain’t no way you’d be seeing this salad on the blog. Sheesh. 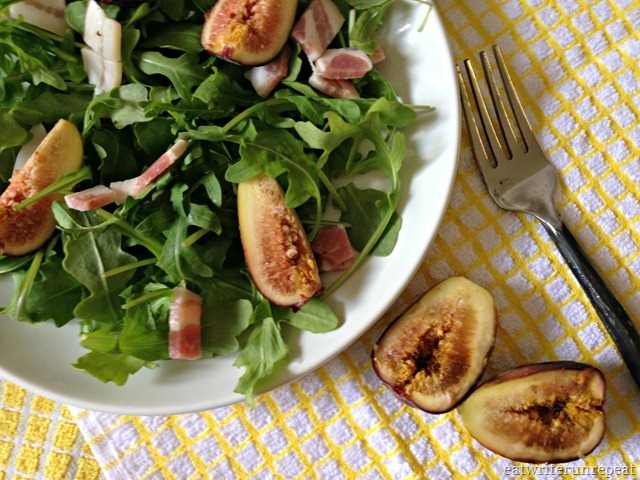 If you’ve never eaten arugula (which is called rocket in Europe, for whatever reason), it can be a little bitter, which is why the salty pancetta and the sweet figs totally complete this salad. It’s super simple, it’s light, and it’s perfect for summer. Actually I can see it being the perfect starter to a salmon dinner, or maybe grilled chicken or something. Or you could do what I did and eat it for lunch, and then again for dinner the same night. Either way, this salad is really easy, really delicious…and have I mentioned you don’t need to turn on your oven? I ate my salad with a simple 18 year old balsamic vinegar, which I love and put on pretty much anything. The balsamic has just a hint of sweet and tangy which (not surprisingly, since I say this all the time), perfectly complements the sweet-and-salty of the figs and pancetta. How much do I love sweet and salty? Oh – and if you can’t find pancetta, you can easily substitute prosciutto slices on this salad. Bonus? 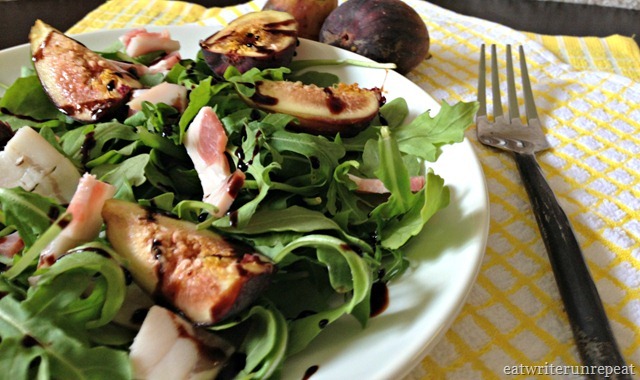 You can wrap your leftover figs with leftover prosciutto for an awesome (and easy) snack! It’s my new favorite. Then again, I’ve been note to wrap prosciutto around pretty much anything, so take that for what you will. 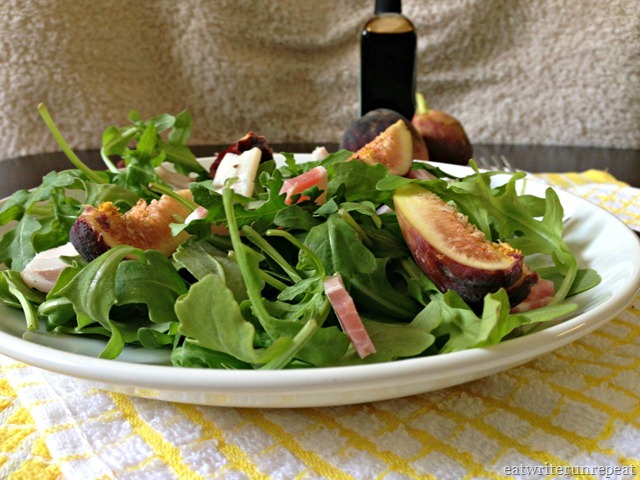 Posted on 25 July 2013 21 July 2013 by BeePosted in Side Dishes, VeggiesTagged arugula, balsamic, fig, pancetta, Salad, side dishes.